I am a member of a neighborhood women’s group that meets every month. This month’s meeting has an Autumn theme and members can bring their favorite Autumn foods. 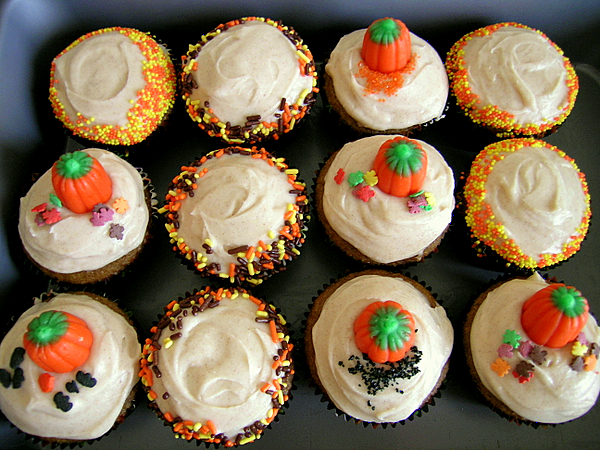 Of course, I had to bake pumpkin cupcakes! 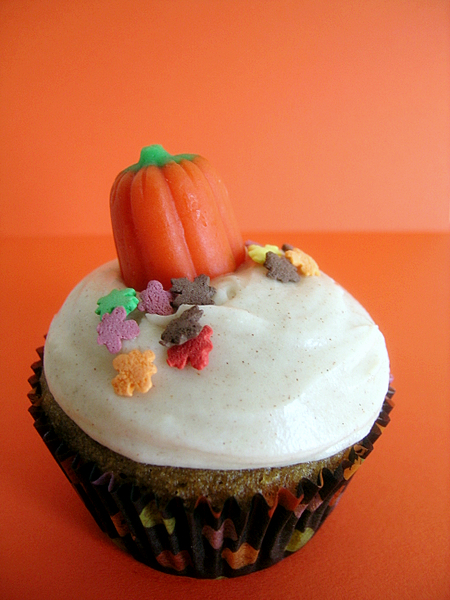 These pumpkin cupcakes are absolutely delicious, soft and moist. I am so pleased with the way they turned out. The original recipe called for fresh nutmeg, but I used ground nutmeg instead. Also, the recipe called for coarse salt, but I decided to use regular table salt instead – instead of the 1 tablespoon coarse salt, I used a little less than 1/2 teaspoon salt. The recipe is from Martha Stewart – and warning about that recipe, it says it makes 18 cupcakes, but the actual yield is closer to 30. I decided to use a cinnamon cream cheese frosting on these cupcakes and this recipe can be found at Recipezaar. This is a really nice frosting as well. I used just a pinch more cinnamon than the recipe called for. 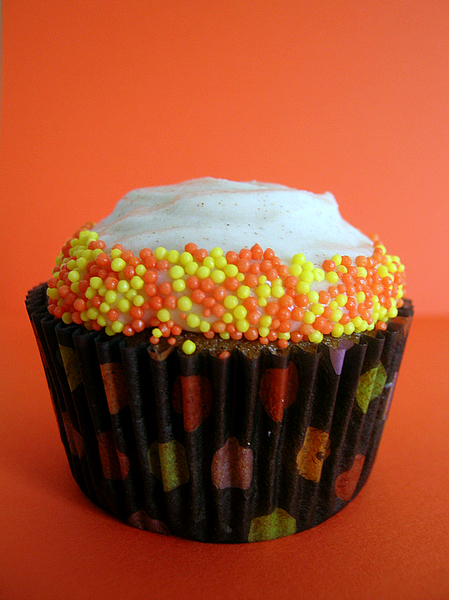 I used Brach’s mellowcreme pumpkins and a jar of Fox Run Halloween sprinkles to decorate the cupcakes. What a lovely coincidence; I have been planning to make pumpkin cupcakes, and it’s great to hear of a Jamieanne-approved recipe. Thanks for the warning on the yield! They look delicious! I just made chocolate cupcakes with a cheesecake-like filling. (pictured on my blog if you’d like to see them). I’m crazy about pumpkin everything! I love these. sooo cute!! Thanks everyone, I really like how these turned out, and everyone at the meeting loved them!